I absolutely love making bread. Not only because of the end result, but because the entire process puts me in a calm mood. From the yeast hitting the warm water to the floured hands kneading the dough, I’m in heaven. And this recipe by Jeffery Alford & Naomi Duguid is a perfect one. I spent just over 20 minutes combining the ingredients, preparing for a 2-hour rise… which gave me enough time to do a few loads of laundry! After the dough had doubled in size, it wasn’t even 20 more minutes before I was devouring tasting my first delicious piece of Naan. Lucky for me, I had two pieces left over from Sunday night’s dinner. And remembering how I’d wanted to try our FFwD Lyonnaise Garlic & Herb Cheese on a pizza, I raced home from work to bake up two mini pizzas for yesterday’s lunch. This is definitely a keeper! Hosts for this week are Maggie of Always Add More Butter and Phyl of Of Cabbages & King Cakes… head over to either of their blogs for the recipe. And for a list of this week’s naan bakers, check the ‘Leave-Your-Link’ post on TWD! Love the pizza idea. I thought the naan was a little to plain. But made breadsticks covered in cheese and herbs that we liked better. It IS a great dough. Great pictures, and you totally beat me to, this would make a great pizza! This morning I made my usual egg, then with the left over butter warmed a bit of a bread in it, sooo good. Not sure what it says about a naan recipe when so many people, myself included, think it should be a pizza instead. haha! 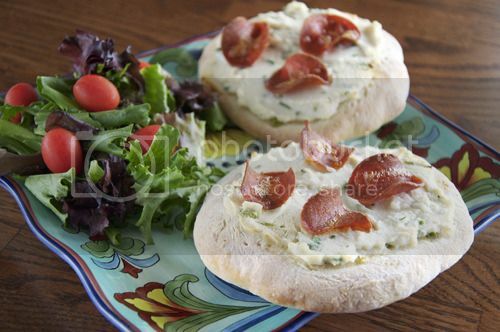 Love the idea of the garlic and herb cheese on it. That stuff is so, so good. Mmmm. Eeek, look at those adorable wee pizzas!! One of the first things I thought when I bit into my naan was that it would make an out of this world pizza crust. Mmmmm. Going to go check out the recipe for the cheese topping you used! They are lovely and I bet the pizza was delicious! Wow! Delicious looking food that’s round! I’m still working on round. 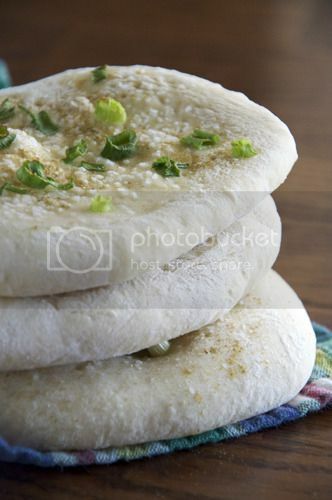 Your naan looks yummy and I like the pizza version also! This dough recipe is a winner and so versatile. Your naan looks tasty! Love that you made mini pizzas because that’s what I did as well! OMG LOVE YOUR TOWELS and all your combos look delicious! thanks for the pizza idea. 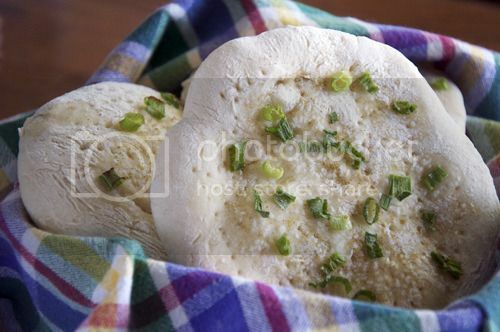 i have some leftover naan in my freezer and that sounds like a perfect use for it!